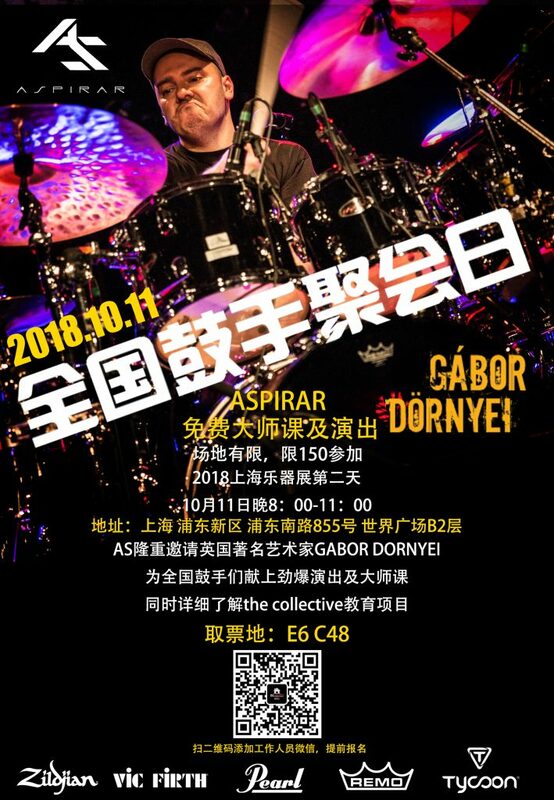 Gab’s Solo Performance/Clinic as part of the China Music Fair in Shanghai, China organised by ASPIRAR on the 11.October.2018! How to play "7 Days" by Sting! Let's get comfy in 5/4. Közzétette: Drumeo – 2018. május 23. Gab’s latest feature in the Worlds #1 American MODERNDRUMMER Magazine titled “Delivering Under Pressure” is available by clicking the MD link. In this write up Gabs talks about his experiences on the global live streaming from DrumChannel in Los Angeles, California, USA. ENJOY and SHARE! Gabor Dornyei LIVE Global Streaming on DRUMCHANNEL from Los Angeles, California on the 30th January 2018 from 8pm PST. 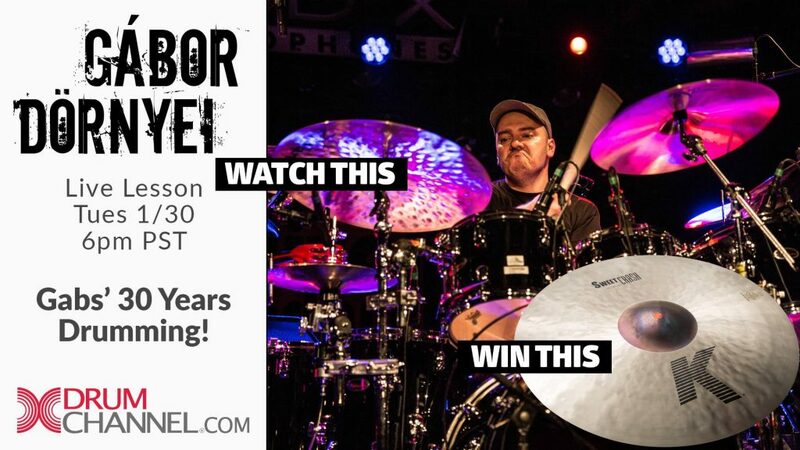 COMMENT on the above DC Facebook link for a chance to WIN a Brand New 2018 Model K ZILDJIAN 16″ Sweet Crash Cymbal, 2x REMO Pro-Packs & 5 Pairs of VIC FIRTH Gabor Dornyei Signature Drum Sticks by simply (positively;) commenting on the video with the most useful part of the lesson! Gabor Dornyei appointed as Head Of Drum Department at JUL ACADEMY in Cosenza, in the gorgeous south of Italy! 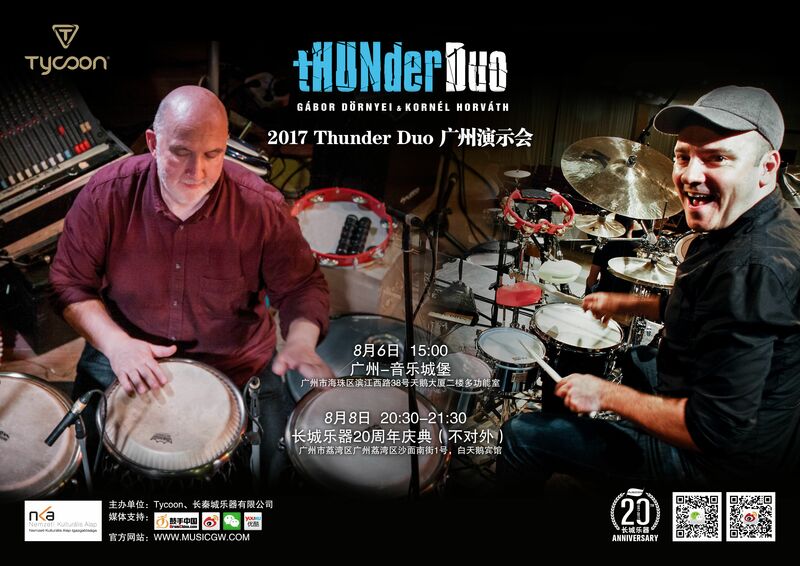 Gabs’s latest clip from THUNDER DUO China Tour in the summer of 2017, featuring Kornel Horvath on percussion. 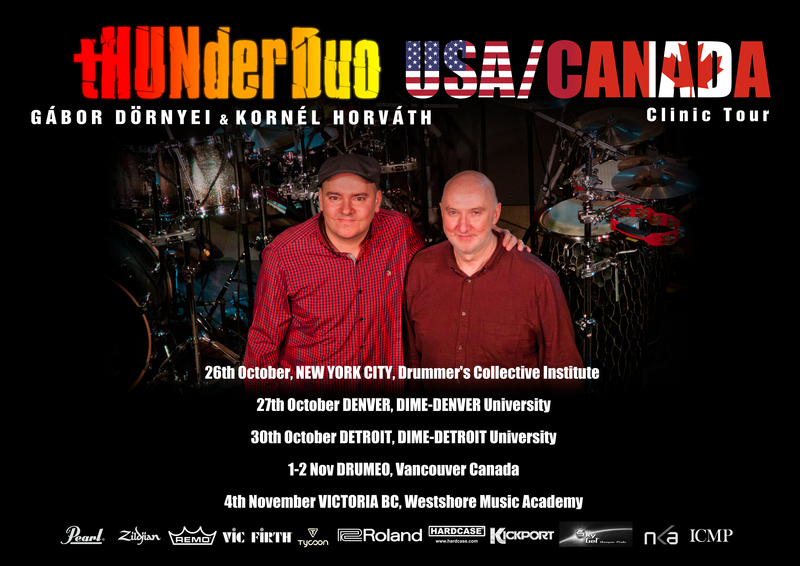 GaborDornyei & Kornel Horvath tHUNDER DUO USA/CANADA Clinic Tour announced! 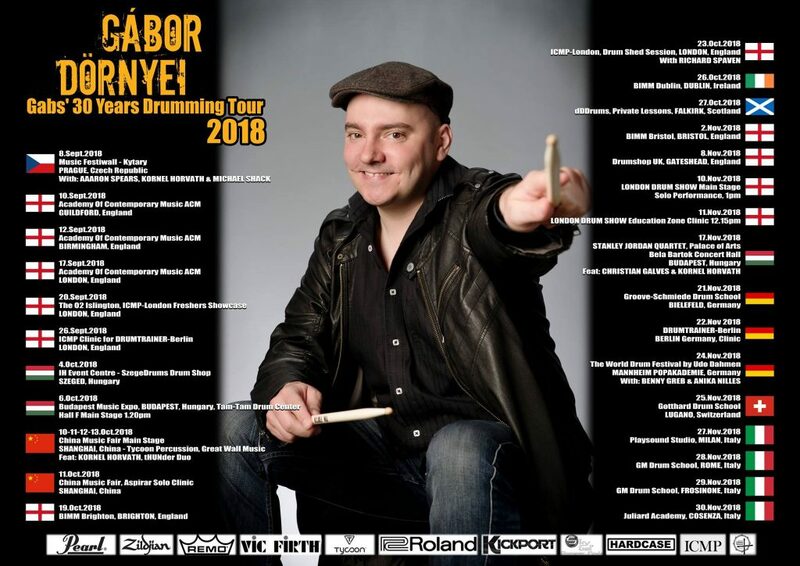 Gabor and Kornel will be embarking on a USA/CANADA clinic Tour next week, starting at the prestigious Drummer’s Collective Institute (DCI) in New York City! We hope to see You on any of our tour dates -see the poster above- and make sure to check out tHUNder Duo’s upcoming DRUMEO Film! WELCOME to the All New GaborDornyei.com Website! ENJOY the site, spread the word and please make sure to SIGN UP to our newsletter to participate in a draw to WIN a pair of Vic Firth Gabor Dornyei Signature #Gabsticks! Tycoon Percussion and Great Wall Music! Brand new Gabor Dornyei Samba Instructional video on UK #1 Mike Dolbear’s Website from the DIME-ONLINE Collection! Gabor Dornyei SEXTET Concert Film from our Latvia Jazz Festival Headliner Performance in Saulkrasti, 2016. Enjoy the 1 hour long edit. NEW Gabs clip from DRUMEO in Vancouver, Canada! Enjoy “One Night in Tunisia” by clicking on the Drumeo link. In 2016 Gabs started gigging with American Guitarist-Piano Player Multiinstumentalist Genius STANLEY JORDAN alongside percussionist extraordinaire Kornel Horvath and Brazilian Grammy Winner Alegre Correa (ex.Joe Zawinul Syndicate) Enjoy the first concert video from the Budapest Summer Festival, Margaret Island Open Air Stage. 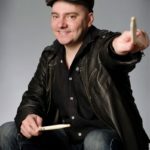 Gabs new tHUNder Duo video with percussionist Kornel Horvath on VIC FIRTH‘s channel from the prestigious London Drum Show at London Olympia Conference Centre. Gabs is on faculty at Mike Dolbear’s ULTIMATE DRUM EXPERIENCE (UDE) in 2016, with Gavin Harrison, Ralph Salmins, Geoff Dugmore, Ash Soan, Jeff Davenport and Richard Spaven. The event will take place at the Bull’s Theatre in Barnet, North London. You can get all info and sign up details by clicking the UDE link above! See You there! A Signature Gabor Dornyei Drum Pack has been released on TYCOON PERCUSSION at the NAMM Show in Anaheim, California! The GD DRUM PACK consist of a Low Pitched Mambo Bell, Mountable Tambourine and a Low Lip Block, all on a Multi Percussion Rack! Check out Gabor’s Drum Pack on MODERN DRUMMER MAGAZINE’s promo video or from Gabor himself at NAMM on DRUMEO’s You-Tube Channel! The product will be available globally, UK Distribution is by Active Music and the USA Distributor is Hal Leonard Corporation.